If you have purchased an IP phone from 8x8, please refer to the following instructions to install and activate your device. To view a video demonstration, refer to Activating Your New Phone. Plug one end of the Ethernet cable into the jack marked LAN on the back of your phone, and the other end into your router or an Ethernet connection. Plug one end of the power cord into the phone, and the other end into an electrical outlet. Connect the handset to the phone with the supplied handset cord. 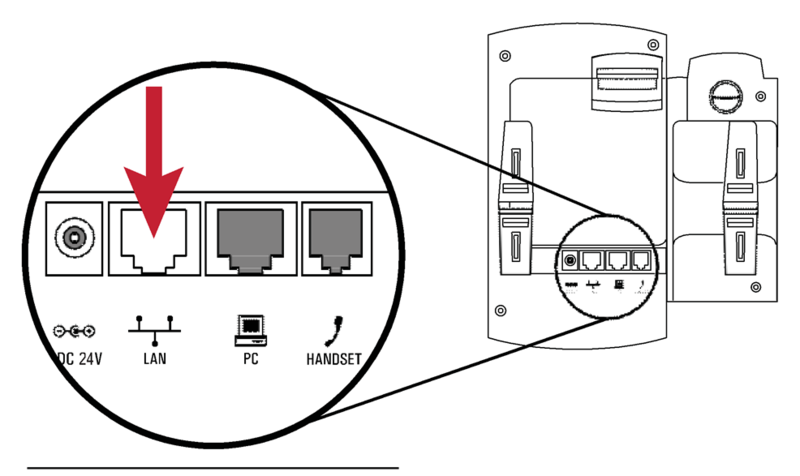 If you would like to plug a computer into the back of the device, plug one end into the PC port on the phone, and the other end into the Ethernet port of the computer. After you plug in your phone, the word Activate appears on the telephone screen. Pick up the handset or press the speakerphone button, and listen to the instructions. Allow your telephone to restart. After restarting, you see the extension number on the screen. You are now able to make and receive phone calls. To reach an external number, dial 1, and then the number. For example: <1 (555) 555-5555>. Note: If you dial 1 and the telephone number, and your call does not connect, please remove the power adapter connection from the back of the phone and reconnect it. Perform these steps for all your IP phones. Once they are activated, please refer to the Account Manager User Guide to learn how to set up your extensions, user profiles, and other services. From the top menu bar of www.8x8.com, click Login > My 8x8 Services, log in, and select 8x8 Account Manager. From within Account Manager, click Phone System from the top navigation bar. Click Activate Device next to the extension that you wish to activate. A pop-up displays the activation code for the extension.